The above image is from Views Table. The values inside Name is title field so it is clickable by default and links to its Node. 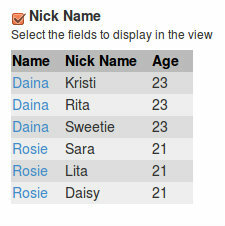 I want to make the values inside Nick Name and Age clickable link too, which will go to the same Node as its title. I went to Nick Name field and did Rewrite Result and Output this field as a link, but in Replacement Patterns there is no Token for link, still I tried with [title], [title:url], [path], [view_node], etc. but it cannot be linked to its Node. Under "Rewrite results", enable "Use absolute link (begins with "http://")"
For Nick name, choose "Output this field as a link"
It's important that the path field be listed first (or at least before Nick Name and age) or it won't be available as a token. Also note that you must use an absolute link for Content:path under Rewrite Results. It's a little counter-intuitive, since the field is being excluded from display, but the setting is still used in the [path] token. Is it possible to get a clean url to be used in Views comment counts? How to remove span from rewrite result in a field view?